Experimental discovery of new materials often proceeds in a trial-and-error fashion and few principals exist that guide the rational synthesis of nanocrystals with specific size, shape, and crystal structure. In particular, the role of ligands, solvents, precursor concentrations, and synthetic conditions on nanoparticle formation are not well understood. Currently, we are developing coarse-grained models of metal-organic frameworks that allow us to study the nucleation and growth of this highly porous class of materials. To bridge the gap in time scales between simulation and experiment, we develop and apply rare-events sampling methods that allow us to study growth under experimental conditions and guide the selection of suitable synthetic conditions. Understanding the thermodynamics and kinetics of structural and compositional changes in nanocrystals is a crucial prerequisite for rational design of new materials. Due to strong surface effects, nanoparticles can adopt crystals structures that in the bulk are stable only at high pressures. Currently, we study the transformation behavior and structural metastability of nanoparticles under shockwave compression. In a different thrust, we are using techniques from machine learning to develop accurate force-fields for semiconductor materials. 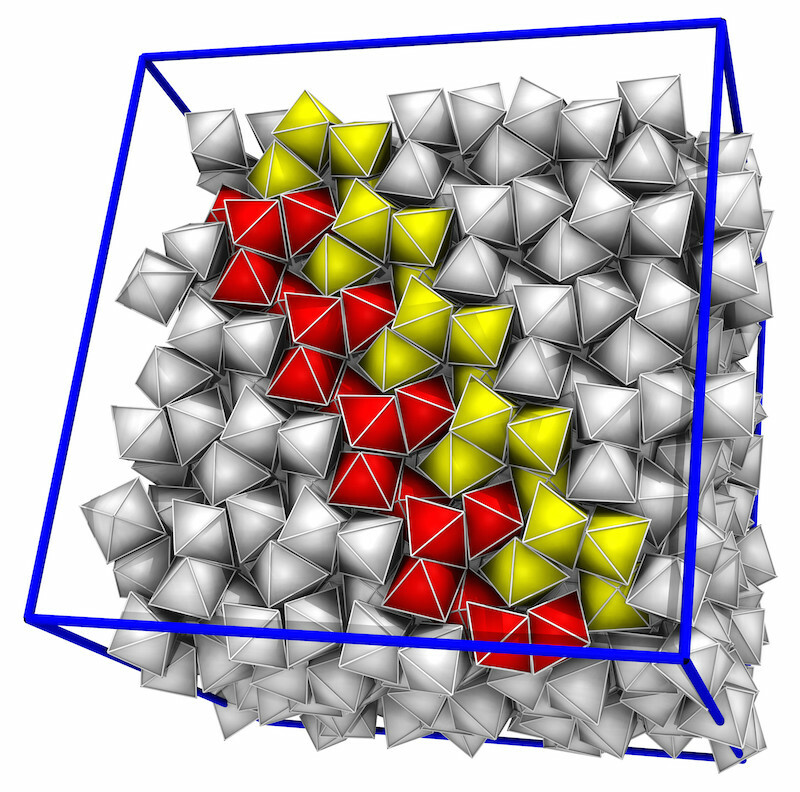 These models help reveal mechanisms of ion-exchange and structural changes in 2D materials. Self-assembly promises a procedurally simple and cost-effective way of building functional materials from nanoparticle building blocks. However, what Nature achieves so effortlessly with biomolecules can be extremely challenging to recreate with synthetic nanoparticles. We use statistical mechanics and coarse-grained modelling to develop experimentally feasible strategies for the assembly of complex materials. Current projects cover the assembly kinetics of DNA-covered colloids, pattern formation in systems driven out of equilibrium, and effects of particle chirality on the formation of super-structures.